It’s the first days after three weeks of harvesting every day allowing me to have a cup of coffee at my desk. Only five plots to go, we’ll finish picking grapes next week. It’s been a hell of a ride. After cleaning tanks, floors and everything else for about a week as quick as we could we started picking Sunday 3rd. Small plot, just the five of us who were here at that time, relatively healthy. It should have been the last day for a while, a nightmare week was about to start. I was expecting the worst when we were coming back from our America trip with all the rot I already saw in August. Drosophilia suzukii had invaded the Regent vineyard which was just dripping of vinegar. The Bacchus wasn’t better. We spent several days deselecting rot. What a frustrating week. The second week didn’t start better. Our precious Fledermaus Schwarzriesling was full of vinegar as well. That sneaky kind hidden in the middle of the grape. Often the bunches looked picture perfect. Then I felt one soft berry, cut the grape in half and bam, there was a vinegar nest. It was so hard to see, we spent three days cutting almost every grape in half, sniffing, tasting, deselecting. After I had fucked up a good batch of Bacchus carbo already I didn’t feel like trying a full carbo again with potentially infected grapes so the 2017 vintage is likely going to be more like 2016. Thank god it got a bit better with the Müller-Thurgau after that. Still quite a bit of rot and lower yields as usual but at least less vinegar. And thanks to my wonderful crew there were good vibes despite the constant deselection work. And then we finally had a highlight harvest towards the end of the second week. 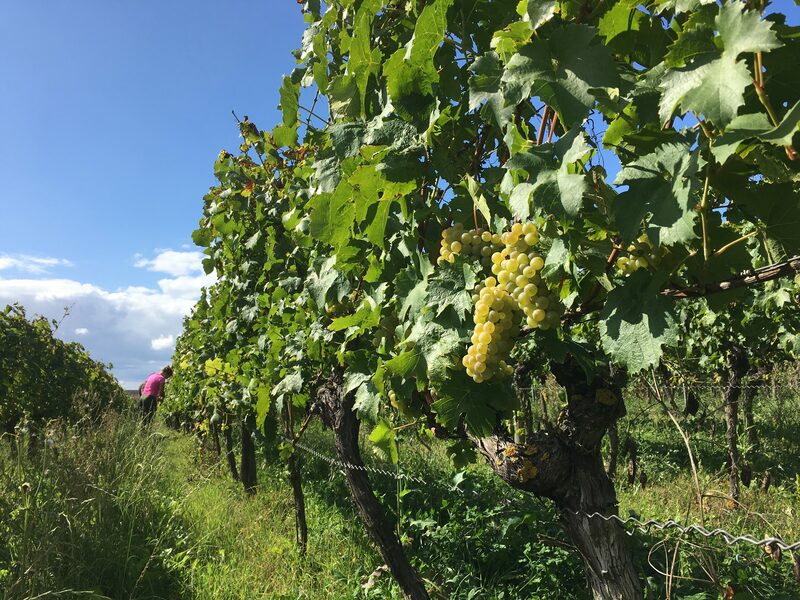 The Grauburgunder / Pinot Gris that I so far used to make a wine exclusively for my dad had a decent yield, almost 100% healthy grapes and it came with a sunny day as well. I had tears in my eyes finally carrying beautiful stuff down to the trailer. And because it was that many grapes we could allow for splitting the harvest: half of it for my dad’s Bocksbeutel, half of it for us to ferment on the skins. With fermentations going super well we had to bottle our Bacchus Pet-Nat earlier than I wanted to. About 4,5k bottles made for a busy day! With most Silvaners not being quite there yet we spent the following days pre-harvesting – you guess it – rot. It had become less hectic though, sunnier, dryer. Tomorrow we’ll start with the grand final, Silvaner after Silvaner the remaining grapes will come in and they’re tasting fantastic. Our hearts are with you Michael & hopes for a big change in dance partner…awesome team to have with you though!